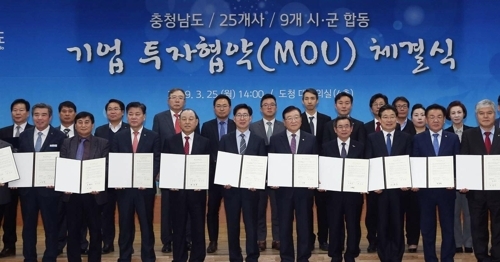 (HONGSEONG=Yonhap News) Chungnam-province signed MOU on attracting a vast number of companies, including those relocating from capital areas, on March 25. Chungnam Mayor Yang signed joint investment MOU with representatives from 25 companies and 9 cities and counties. The 25 companies will invest KRW 461.6 billion in 9 cities and counties including Cheonan, Boryeong, Asan, Gyeryong, Dangjin, Geumsan, Secheon, Hongseong and Yesan, in the land area of 598,316 square meters. Of the companies signed MOU, 10 are relocating their headquarters, and 7 are moving out from capital areas. The province estimates that 1,397 new jobs will be created. To name a few, Jardin, a coffee company, will invest KRW 16.1 billion on the area of 16,123 square meters in BIT General Industrial Complex in Cheonan from 2021 to 2011 to build a new factory, while Toptech, a semiconductor facility company will invest KRW 18.7 billion from 2023 to 2026 to build a new factory in the same industrial complex. In Geumsan Agricultural Complex, specialized in medicinal herb, Toeum (health food company) will invest KRW 10.6 billion, while Dow FS invest KRW 5 billion until 2022. The province expects that if all the companies make investment and operate factories as planned, it will result in about annual production of KRW 519.5 billion and KRW 112 billion added-value. Mayor Yang said "We will not spare any efforts in making all the companies signed MOU can concentrate on their business activities".